What if the necessary work related skills of an internship were combined with a think tank to empower high school students to be ready to boldly take on the future? The Career & Technical Education (CTE) Summer Scholars program is doing just that. With a broader focus on connecting individuals to meaningful employment, Bank of America has partnered with the Fund for Public Schools and NYC Department of Education since 2012 to help youth stay in school, graduate, and connect to post-secondary education, while also inspiring them to discover a fulfilling career pathway. With close to 100 students participating this summer, 490 alumni have now been through the program. The seven-week CTE Summer Scholars program combines direct exposure to work, employment coaching to support students in their first work experience, and hands-on summer school opportunities that underscore the connections between the worlds of work and school. Students earn a working wage and the program is designed to provide a structured, positive work experience with academic support to help the scholars discover careers in sectors considered high value in the New York City economy. These include areas such as Design/Web Development, IT Services, Market Research, Marketing/Content Development, Media/Event Production, Database/General Office. The bright and talented teens who earned this opportunity are junior and senior high school students who are enrolled in CTE programs at their respective high schools: Bronx Academy for Software Engineering, Manhattan Bridges High School, New Dorp High School in Staten Island, The Urban Assembly Maker Academy in Manhattan, Transit Tech High School in Brooklyn, and Information Technology High School in Queens. For the first time the CTE Summer Scholars program was in high schools in every borough. 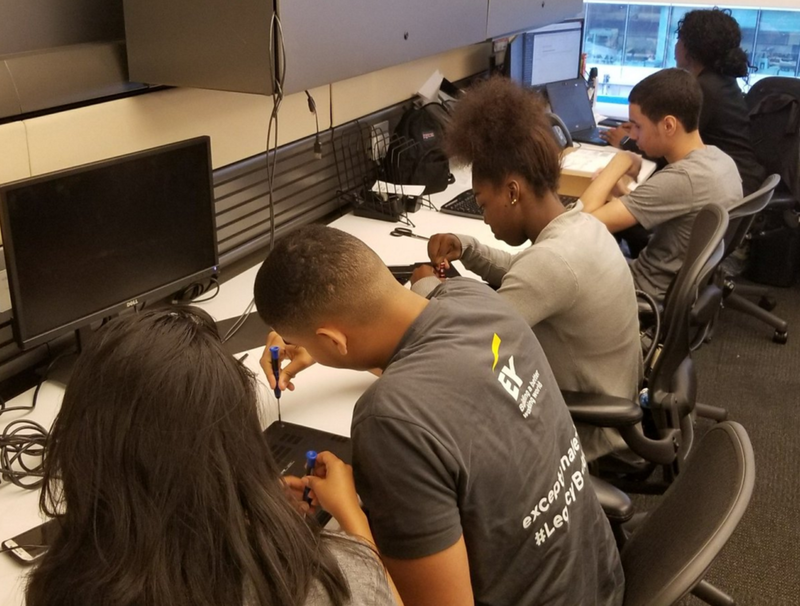 High school interns developing skills in hardware and databases at EY. As part of the program, students intern at a company or organization for three days a week and then participate in a Youth Think Tank with their classmates at their home schools the other two days. The program matches each school with a Client / Mentor – a non-profit organization working in youth employment to share a real-world problem of practice with the students. Using a collaborative design thinking process, CTE teachers lead the students and their Client / Mentor to explore challenges such as how to increase the number of students who apply for internships on Staten Island, or increasing interest from high school students in cybersecurity degrees at a community college. Drawing on their academic skills, their technical skills in IT, programming, and graphics, and their own experience as first-time workers, students craft proposals to their Client / Mentor on ways to better serve their peers. Students presented their learnings and recommendations to their host companies, community leaders, and industry partners at the Youth Think Tank on Youth Employment on August 18th, the culminating event of the CTE Summer Scholars program held at Bank of America’s NYC headquarters at One Bryant Park. In one room, each CTE high school displayed their poster-presentation projects as interested onlookers circled the room and asked the summer scholars questions about their individual projects. In another room, the summer scholar groups rotated every 20 minutes to take turns formally introducing their project to a sit-down audience. Jason Hermita, a graduate of Queens Vocational High School, and a summer scholar alumnus, beamed with pride as he visited all six of the CTE high school poster-presentations. This marked the first time that CTE Summer Scholars alumni were invited to participate. When asked what was the greatest advantage he gained from the program, Hermita said “[it] helped me figure out what to do with my life. The job that I held wasn’t exactly what I wanted to do but it helped me figure out how to get there. I learned how to work hard and make connections.” Today, Hermita is enrolled at SUNY Polytechnic Institute in Albany and majoring in Cybersecurity. This summer he worked at the Port Authority of New Jersey as a Cybersecurity Operator Consultant. If you agree Bank of America is getting it right by helping NYC public school students prepare the workforce, consider joining them and become a part of the work with the Fund for Public Schools today.